But the mud-spattered village of Malihabad has its temptations (forgive me for this digression, I’ll come to the mangoes in a trice): the men are really handsome, they all have beautiful smiles peeping from behind their spruced-up beards. Some even practice the dying art of chivalry! Okay Lord, I apologize for transgressing the path of duty and getting tempted. But my bones were creaking and I needed some distraction to forget the ache. On the map, Malihabad looks like Lucknow’s coquettish neighbor sitting barely an inch away. Even the cartographer’s legend would have you believe that it is only 21 miles away, but when you have to travel on a terribly rutted road and in a heat that can singe a dainty damsel, those 21 miles seem like the Devil’s alley. As if that wasn’t enough, the car’s air conditioner died on the way and wind raked up all the dirt from the streets. If I did not roll up the window, within a mile I would have looked like a sack of Fuller’s Earth and a bone or two would have fallen off. I beckoned all the patience from my repertoire and looked around—Sadhvi Panchi Devi was promising a confirmed ticket to Heaven, there was Mighty chilled beer, a drug rehab center, and an Exhort Grammar School. Yes, there were the statuesque mango trees and the whiff of the luscious fruit. If you are a stranger in Malihabad and don’t know which names to drop or what addresses to look for, just hop off at any dhaba and ask for Kaleemullah Khan or his Abdullah Nursery. They all know about him, they are all arrogant about him. And why not? So puffed-up is this conceit that its most famous mango grower once got a letter from Jeddah that only had “Kaleemullah Khan, Malihabad, India” on the envelope. Says something about the man, doesn’t it? Once Khan returns to his fiefdom, he spews more information—how angry parrots peck the fruits, how naughty squirrels fatten every summer on mango juice, and how the bhoonga bug is any orchard’s most frightening nemesis. But according to Khan, these are mundane traits. Every mango, like a human being, has its intrinsic virtues, he says. Khan is so passionate about mangoes that he almost gives them a human garb. Khan inherited the 20 acres of mango plantation from his father Abdullah Khan and years ago started experimenting with crops and breeds. That’s when he grafted one variety on an Asroor Mukarar tree, then another, then another … . 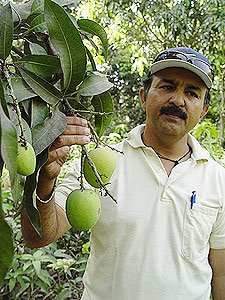 Now he nurtures 300 varieties of mangoes on that one tree. 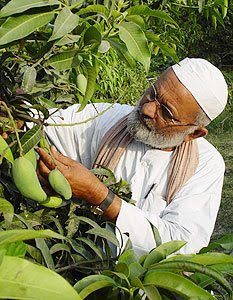 Such is his love that he refused an offer by the Iranian government to settle in Iran and do what he loves—grow mangoes. Khan is not willing to leave Malihabad, it is his love; it is his fiefdom. Perhaps an experimental streak and an attractive smile are both genetic traits with the Khans. 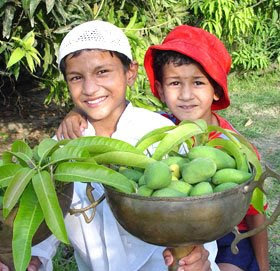 Kaleemullah’s younger brother Hamidullah, who owns nearly 50 acres of mango orchards, slogged seven years to develop a late variety of mango that would yield fruits even in winter. Hamidullah has not christened the tree yet, but he dreams of a day when people will sit by the fireplace and eat their winter variety of mango in December. Like the elder Khan, he too smiles beatifically. During the mango season, this experimentation of varieties is shelved, as are the trophies and awards. Summer is the time to rake in the moolah. Much before the fruits acquire that golden yellow tinge, the orchards are auctioned. But it is no ordinary auction where a rag-tag of ordinary mortals gather and holler their bids. There is a method to this madness. Days before the auction, a man with a gargantuan amplifier on a rickshaw scours through the muddy lanes announcing the date, time, and venue. Then the prospective buyers are allowed to preview the “for sale” orchards. They move around in groups, assess, and finally huddle in the evening with the elders to decide a price cap. Just before the auction there’s a flurry of activities—plastic chairs are arranged, tumblers are cleaned, water is spattered on the ground for the rowdy dust to settle. Then the buyers start arriving in rickety bicycles, fancy cars, and sleek motorcycles; some just meander on foot. The seller sits with knitted brows, twiddling his thumbs, while buyers tick off the who’s who and mull on their strategy knowing who they are pitched against. Look at Guru Prasad in striped shirt and gray trousers, you’d assume there wouldn’t be too much stashed in his coffers. Or Baba, in a red robe and stringed rudrakash; you’d think Baba’s truth is God, but wait till he raises the bids by thousands. And in the midst of all this is the master screamer—Ramzan Ali, unkempt and uncouth, but with a decibel level of Mach 3. He is Malihabad’s master hollerer, and for the hours he spends screaming he sure ends up with a sore throat every night. I sat through an auction of 200 trees that began with a bid of Rs 50,000 ($1,150) and ended at Rs 1.33 lakh ($3,000) all in about two hours. There are neither gavels on a mahogany desk nor any digital displays. The most literate among those present scribbles the bids on a piece of paper and once the deal is struck, jalebis and laddoos seem to emerge out of thin air. Not really; Afsak Ahmed and his rickety cycle do the trick again. If Malihabad had its raison d’être, another village barely six miles away has its own reasons to celebrate. Essentially, just one reason. It is a mango tree that they say rose out of the earth as a blessing some 300 hundred years ago. 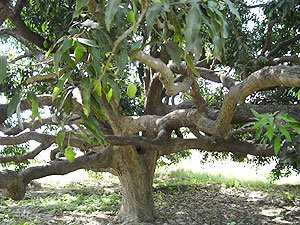 The tree borrowed its name from the village of Dusseheri on whose soil it has livedand borne fruit for centuries. And of course, the mango purists would always vouch for the delicate taste of a ripened Dussehri. They'd say even the manna from from heaven would pale in significance. The tree, which attracts mango aficionados and curious onlookers from all over, was, and remains, the property of the Nawab of Lucknow. No ordinary mortal can enjoy the fruits of this tree—it is never up for sale in the market. The fruits are hand-picked, arranged in a basket and sent to the Nawab’s family who, interestingly, also has a mansion called Dusseheri House. 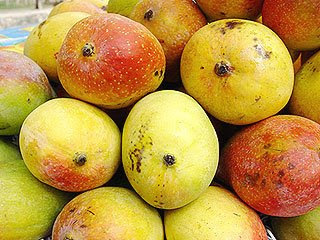 I had been in Malihabad for two days, my ears were buzzing with all the mango anecdotes; perhaps my iris rented the colors of the mangoes, too, and I could barely see anything else; I had also probably fattened like the squirrels. I did not want to count the numbers of mangoes I had eaten or the sinful calories I has ingested; I ignored the abacus merrily. Believe me, it was heavenly to be sinful that one afternoon in Malihabad. By Air: Take a flight to Lucknow’s Amausi airport. From there you can hire a cab for Malihabad, which is 21 miles away. By Rail: Take the Shatabadi from New Delhi to Lucknow. By Road: Take a bus or cab from Lucknow to Malihabad. Buses headed to Hardoi will also drop you at Malihabad. Remember, it is a rough ride. There are no hotels in Malihabad. Lucknow will have to be your base camp. - The house where poet Josh Malihabadi was born. His relative Asif Hasan Khan has some rare photographs of Malihabadi and his handwritten letters. - If you are a history freak, go to ancient palaces of Sayed Khan and Qazi Kamaal Khan; movies like Umrao Jaan, Kalyug, and Junoon were shot there. - Look for Kakori kebabs in the neighboring village of Kakori.